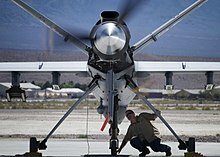 Up to 14 AGM-114 Hellfire air to ground missiles can be carried or four Hellfire missiles and two 500 lb (230 kg) GBU-12 Paveway II laser-guided bombs. The 500 lb (230 kg) GBU-38 Joint Direct Attack Munition (JDAM) can also be carried. Testing is underway to support the operation of the AIM-92 Stinger air-to-air missile.